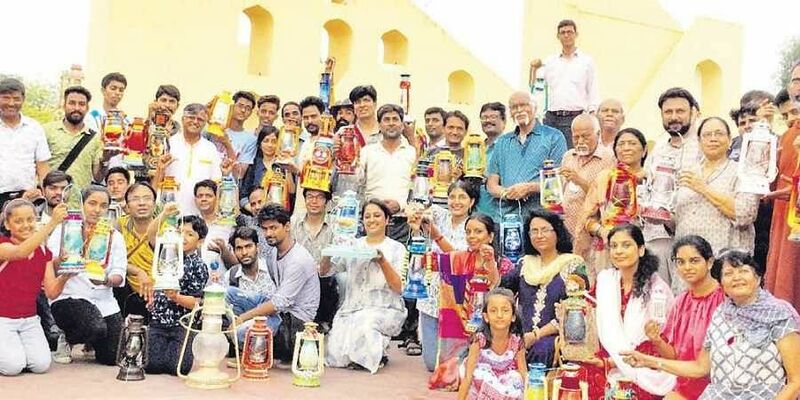 A group of astrologers and scholars assembled at the Jantar Mantar in the city recently to predict rains using the instruments at the observatory. JAIPUR: The arrival of monsoon is no less than a festival in Jaipur. In a city that has no river and the available water sources have virtually run dry, the rainy season is desperately awaited. The hottest topic of discussion these days is when the rain gods will shower their blessings on the city. A group of astrologers and scholars assembled at the Jantar Mantar in the city recently to predict rains using the instruments at the observatory. It’s an annual ritual carried out on the Guru Purnima day for the past 200 years. It involves hoisting of a flag and after observing the direction and intensity of winds at a particular time, the astrologers make their predictions. “It is a more accurate method than today’s modern science in forecasting rains,” avers Vinod Shastri, renowned astrologer and former vice-chancellor of Sanskrit University in Jaipur. Shivdutt Sharma, another astrologer, said: “Previously, the flag used for observing the wind’s flow and direction was worshipped one month prior to the Aashadh shukla purnima. At the time of sunset, all prominent scholars, astrologers and city residents used to gather around the flag.